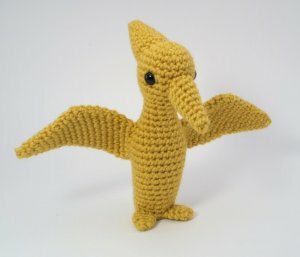 An original crochet amigurumi Pteranodon pattern from the dinosaur range by June Gilbank. Pteranodon was a type of Pterodactyl, a member of the Pterosaur family. (Pterosaurs aren't actually true dinosaurs, but flying reptiles that lived in the same time period.) Pteranodon had a 20-30 ft wingspan, a long toothless beak, and a characteristic cranial crest at the back of its head. It ate fish and molluscs and lived in the late Cretaceous period. Note: Take advantage of the savings when you buy this pattern as part of the Dinosaurs Set 2 multipack! Date Added: 09/29/2015 by Jaclyn M.
Date Added: 01/25/2014 by Alicia B. Date Added: 07/05/2012 by Heather L.
Date Added: 06/27/2012 by Chrisie M.
Date Added: 06/10/2012 by Rebecca P.
Date Added: 01/17/2012 by Jennifer H.
Date Added: 08/15/2011 by Monica B. Date Added: 01/15/2011 by Kateryn R.